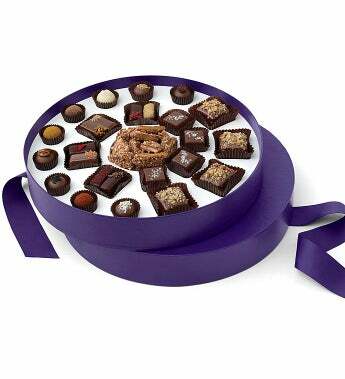 This stunning round gift box of exotic chocolates offers something to assuage every chocolate desire. This unique ""in the round"" gift display features Exotic Truffles, Organic Peanut Butter Bonbons, Caramel Marshmallows, Sweet Butter Toffee, and Exotic Caramels. Serves about 8-10 people. Since 1998, Vosges Haut-Chocolat has been fusing spices, nuts, roots, herbs, bark,s and tonics from around the world with super premium proprietary chocolate. A pioneer of the exotic chocolate movement, founder Katrina Markoff, harnesses the power of storytelling through the medium of chocolate, opening minds, spirits and palates to new ideas. Check out the More Product Information tab for the full listing of flavors in this special gift box. This stunning round gift box of exotic chocolates offers something to assuage every chocolate desire. This unique "in the round" gift display features Exotic Truffles, Organic Peanut Butter Bonbons, Caramel Marshmallows, Sweet Butter Toffee, and Exotic Caramels.